Claiborne, Jenne. 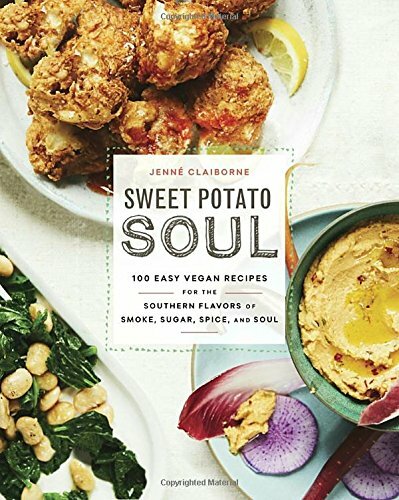 Sweet Potato Soul: 100 Easy Vegan Recipes for the Southern Flavors of Smoke, Sugar, Spice, and Soul. USA: Harmony books. 2018. Mixing vegan with Southern cuisine in her new cookbook, cooking instructor, blog creator, and vegan chef, Jenne Claiborne, proves taste, soul, health and tradition can truly be combined. Named after her blog and YouTube channel, Sweet Potato Soul shares recipes, knowledge, personal stories and a bit of spiciness. Recipes for breakfast, salads, soups, sides, sauces, mains, desserts and drinks are included in a well organized manner. Coupled with beautiful photography, diners won’t miss the meat at all! Surprised to find such a tempting cookbook filled with vegan recipes, it was perfectly pleasing both visually and content-wise. Already being mindful of what I eat and heading towards a more vegan lifestyle, I was thrilled to find the recipes easy to prepare, the ingredients easily accessible, the information helpful and the meals nourishing, healthy and delicious. Favorites already, Sweet Potato Hummus and Sweet Corn Succotash are Southern and so delectable- they will be staples in our house from now on. So enjoyably appetizing! This entry was posted in Clean Eating, Cookbook, Healthy Lifestyle and tagged Cookbook, Cooking, Food Photography, Healthy, Healthy Cooking, Healthy Eating, Healthy Lifestyle, Inspirational, Recipes, Southern Cooking, Sweet Potato Soul, Sweet Potatoes, Vegan by Savurbks. Bookmark the permalink. Sounds like a good book for a hearty meal! Agreed! There are several really delicious (and easy) meals which are both tasty and hearty! Enjoy!